For the fourth consecutive year Comerica earned a perfect rating of 100 percent on the Human Rights Campaign (HRC) 2018 Corporate Equality Index (CEI). The rating earned Comerica the designation as a Best Place to Work for LGBTQ Equality. The 2018 CEI is the national benchmarking tool on corporate policies and practices pertinent to lesbian, gay, bisexual, transgender and queer employees. The CEI rates companies on detailed criteria under five categories that include non-discrimination policies; employment benefits; demonstrated organizational competency and accountability around LGBTQ diversity and inclusion; public commitment to LGBTQ equality; and responsible citizenship. Comerica was one of 609 major businesses across the country to earn a perfect score – the highest number of 100 percent-rated businesses in the history of the CEI. Diversity is one of Comerica’s seven core values with a commitment to create a diverse and inclusive work environment. Comerica’s LGBT & Allies groups, composed of employee and business resource teams, have remained instrumental in achieving a perfect rating on the CEI. The group continues to provide outreach and support of the LGBTQ community by sponsoring and volunteering for charitable and business-focused events that are pivotal to the LGBTQ community. 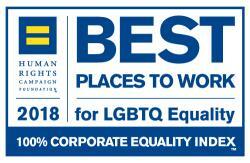 For more information on the 2018 Corporate Equality Index, visit www.hrc.org/cei. Comerica Incorporated (NYSE: CMA) is a financial services company headquartered in Dallas, Texas, and strategically aligned by three business segments: The Business Bank, The Retail Bank, and Wealth Management. Comerica focuses on relationships, and helping people and businesses be successful. In addition to Texas, Comerica Bank locations can be found in Arizona, California, Florida and Michigan, with select businesses operating in several other states, as well as in Canada and Mexico. To find a Comerica location near you, visit www.comerica.com/local.